Laundry Room Cabinets are a Must-Have in 2109 | Special Additions, Inc. Looking to put more storage and style into your laundry room? Consider installing customized laundry room cabinets. Whether your laundry room is big or small you can make laundry day more organized and efficient with these helpful cabinetry tips. 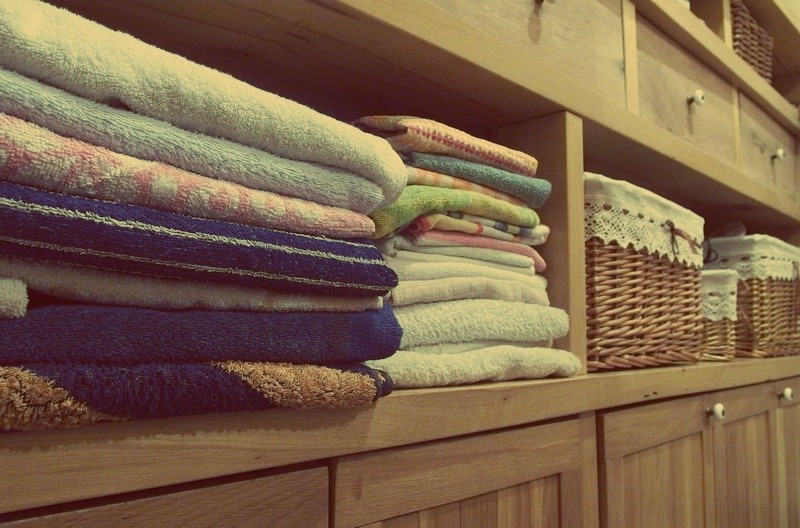 Our first tip is the most obvious: If you don’t have cabinets in your laundry room, then definitely install them soon. You can almost always benefit from installing a few laundry room cabinets, even if it’s just basic overhead horizontal cabinets and shelves, or vertical cabinets. In addition to hiding unsightly half-full bottles of cleaner and other necessary products, they also serve as a defined place for laundry supplies. No more hunting for bleach or fabric softener. Everything will be exactly where it should be. Think about narrow areas differently to gain more laundry options. Traditional laundry room cabinet ideas typically leave some space between the larger cabinets and countertop. You can make use of that usually discarded area with slim storage cabinets, which are perfect for smaller laundry care items like stain pre-treatment sticks, dryer sheets, and lint rollers. Or, a hidden nook between wall studs is the perfect place for a fold-out ironing board. The ironing board folds up when not in use while products that are used more often can stay within easy reach. If you aren’t interested in a pull-down ironing board, then perhaps a pull-down drying rack might be more appealing. Either option makes creative and clever use of what would be wasted space. If space is at a premium, and there’s not much room to even open doors, consider other options for your laundry room cabinets. For example, sliding or bi-fold door options will conserve much-needed square footage. Make sure that your laundry room cabinets include a variety of storage types – some large cabinets, some open shelves, a couple of narrow slots, and a few closed doors. This gives you multiple ways to store laundry room necessities and more. For example, larger upper cabinets can stash seasonal items such as coats, gloves, hats, and mittens to allow for more everyday items to stay close at hand. If you have a more expansive laundry space, you may have room for the little extras that make a big difference. A simple tension rod, for example, is very convenient if you iron in the laundry room and want to hang up garments immediately to keep them wrinkle-free. Open shelves can hold baskets to help the laundry room look neat, tidy, and well-organized. You may even want to consider wainscoting and crown molding, which adds visual appeal to your laundry room. If your washer and dryer sit side by side and are both front-loading machines, then consider installing a shelf right above the pair. This gives you a convenient workspace where you can immediately fold laundry when it’s done drying or pre-treat tough stains before you put garments into the washer. If you don’t have space or budget for a built-in shelf consider a panel placed on top of your washer-dryer for folding or open storage. All white cabinets provide a fresh, clean look to your laundry room. But laundry room cabinets don’t all need to be the same color. Complementary hues, especially in a more neutral palette, help to lighten and brighten very small spaces. If you want your home to be more organized, then laundry room cabinets and shelving are a must have. Contact Special Additions today to discover our cabinetry solutions for kitchens, bathrooms, and laundry rooms. We’re one of the largest and most reputable cabinetry dealers in the New Jersey/New York Area. We’ve been family owned and operated since we opened our doors in 1978. If you’re looking for high-quality cabinets and outstanding customer service, then contact us today.